This piece was commissioned by a corporate customer of mine that had already installed several of my large abstracts in their facility. This 5 panel painting that you see here was designed for a 30 ft wall in the main entrance hallway of their building. Most of the employees in this company deal with stressful situations on a daily basis so the owners intentionally install artwork that is contemplative and soothing. In working with the owners, I knew we wanted to design a piece that was calming, happy, and meditative. An additional exciting requirement of this commission was a collaboration with another artist, sculptor Ancizar Marin who happens to create koi fish that the owners were in love with. A koi pond was the perfect design to incorporate Ancizar's sculpted koi fish with my dimensional abstract painting style. The entire piece was to be created in 5 separate panels of 48x60 each with a completed size of just over 20 ft wide by 5 ft tall. 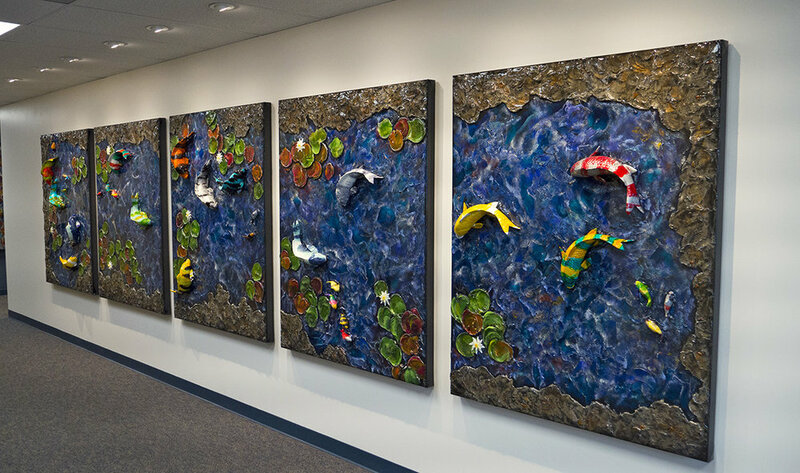 The koi fish were integrated into the painting during my scultping phase, and in the finished piece they appear to be floating just on the surface of the painting. There are two different sizes of koi integrated into the painting. In addition to the sculpture and oil/acrylic painting, I also cut and fired multi-layered kiln formed glass for the water lilly flowers and included kiln formed glass accents on the earthen borders of the koi pond. I always enjoy letting someone's imagination create what lies beyond the edges of a painting, and in this piece I let the koi pond flow past the edge without creating a border around the entire pond. It was important to me to let the koi fish be free. This final image is a great example of proper lighting on my paintings. We worked with the customer to select the location and type of lights for the installation. Notice the contrast between the photo of the painting on the left vs. the photo on the right. The photo on the right has my recommended lighting installed. This piece was a significant departure from my usual abstract and wine paintings, but it was a wonderful creative "stretch" and I enjoyed working on on such a large piece and the collaboration with another artist.